They are fantastic at hiding. They are primarily active at night, in the dark. They may not live on the property. They may just visit for food and water. 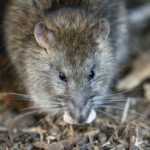 Many homeowners have discovered unexplained rodent droppings in their garages, and many businesses have found that something has eaten away at something important despite no clear signs of rat presence. But out of sight is also not out of mind. Rodents can eat threw electrical wires, causing a fire hazard. They often carry diseases, as well as bacteria that may lead to allergies or illness. And their strong teeth are powerful enough to rip through walls and cause expensive damage to your property. Rats do not respond to pesticides the same way that bugs do. They need special exclusionary treatments, the right traps to eliminate those already on the property, and ability to prevent them from entering in the future. Local Pest is here to help. We provide this type of rodent control for both homeowners and businesses throughout BC, with affordable rates and guaranteed service, sealing off all entry points and making sure that they cannot come back. Local pest control. It is right there in our name. We know you have a choice in pest control companies, and we’d like to prove to you why we have developed such a positive reputation in the industry for our commitment to detail and customer care. For more information, contact us today to get started.